Even though airline status may no longer make sense for even the most frequent leisure traveler, I said on Wednesday I think there is still a case to be made for hotel status. Today I’ll expand on that argument. You could just book all your flights with miles, if they’re really so cheap to acquire. Book yourself into business or first class and get most of the benefits you might otherwise get through elite status. 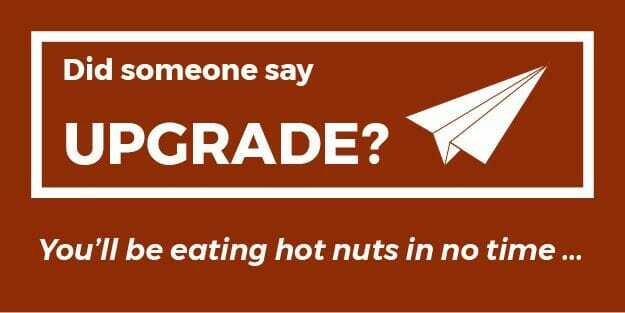 You also won’t have to worry about whether your upgrade will clear. You’ll get lounge access on the international flights, priority check-in, and a whole lot more. Award redemptions match up with elite status very well, and the only major loss is the ability to change award tickets without a service fee. The value of a fee waiver depends on your booking habits, but some change a ticket a dozen times and others only once. It’s rare that your status benefits get much of a workout except to waive change fees. And paying such fees just might be worth it if by forgoing status you still save money overall. However, when I book an award stay at a Hyatt hotel — or pretty much any hotel with which I have status — my elite benefits include a complimentary upgrade, bonus points or a welcome amenity at check-in, late check-out, and either breakfast or lounge access. Those perks are not included with just any award stay. Starwood, Hilton, and other hotels offer similar benefits to their members. In certain cases you can even get a complimentary suite upgrade on an award stay. Access to a standard domestic hotel lounge is maybe $10. Often the food is not much better than a pastry and some coffee, saving me a Starbucks run. If I get a meal at a restaurant or an international lounge, then I’ll bump it up to $20. Just last weekend I was staying at the Westin Palace in Milan, where my “continental breakfast” for two turned out to be a full buffet that retails for EUR 40 (about $55). It certainly wasn’t worth $55, but I would have paid $20. I’ve sometimes treated family or friends to breakfast using my Hyatt benefits and been able to avoid a bill even higher than the room rate! I also regularly take advantage of early check-in and late check-out perks, even when the former isn’t officially promised. Such benefits might cost $40-100 at a resort hotel, and I do think they are worth the retail cost. Who wants to get kicked out of a hotel on Sunday morning when you don’t head home from your vacation until dinner? Then we get to upgrades. I really value hotel upgrades. Not on every trip; I certainly don’t need a suite when I’m by myself. But when with family I like to have the extra space. The difference in retail cost between a standard room and a suite can be anywhere from $100 to $500 or more every night. My valuation probably ranges closer to $20 to $100 per night. But most importantly I get to spend more time in my suite, whereas an airline upgrade is rarely for more than a few hours. So elite status gets you some extras, and those might be worth more at a hotel than when flying an airline. Are those extras worth the cost? Possibly. When you take a weekend vacation, you could travel any distance but will probably always spend two nights in a hotel. Take one such trip a month, and you’re staying 24 nights in a hotel. That’s still 26 nights or 13 stays from the top tier. Well, you probably also take two longer trips of one week each. These might be international, so you fly more but stay 6 nights each. Now you have 36 nights and 14 stays, 72% of the way to your goal. For all I know more than half of those were ineligible award tickets, particularly those international trips. Short flights, especially add up quickly in cost without contributing much to my elite status. But depending on the hotel chain you chose, your award stays still count toward elite status. If you decide to do some hotel hopping every night to count each night as a separate stay, you could already be done! If not, there are mattress runs. Mommy Points indicated she was frustrated with mattress runs, but I think they are much more accommodating than mileage runs. She’s upset that she has to drive back and forth to check in, but I think this says more about where she chooses to live since in Seattle I can just walk down the street to six Hyatt and Starwood hotels to pick up an extra stay on my way home from work. Rather than compare two people’s approach to mattress runs, let’s look at the time it takes to do a mileage run. I bet just getting to and from the airport takes the same amount of time for her as driving to the hotel, and it certainly takes me about two hours on either end. Then there’s all the time sitting on a plane and the likelihood I’m leaving earlier in the morning and getting back after midnight. Mattress runs, however, tend to involve only the travel time and not actually staying in the hotel. Within the U.S. you usually don’t even have to check out in person. Mattress runs are also cheaper and easier to find. If you’re 40,000 miles short, that’s an extra $1,600 on mileage runs at a good 4 CPM that takes some searching. If you’re 14 nights short, that’s $1,400 or less at your local budget property, which is probably the same price throughout the year unless there’s a major event. I happen to live in a city where there aren’t many inexpensive candidates, but winter is more reliable and there are opportunities to check in to airport hotels during layovers. Sometimes I’ll even mattress run across the street when I’m staying at a competing brand. Finally, hotels offer more generous bonus opportunities than airlines for earning elite status and extra points. An airline awards miles only for your own tickets. Starwood awards credit for up to three rooms booked as part of the same reservation. Go back to the scenario where we ended up with only 36 nights for the year. What if you take the kids on one of those 6-night trips and book a second room? Now you have 42 nights. Heck, if you find a great mattress run you should book them three rooms at a time. Book your stays at specific times to earn even more. Hotel promotions are pretty regular and often apply to most of the chain’s properties, yet you never know when an airline will offer a bonus or if it will be for a route or fare class that works for you. If you’re a Hyatt fan, figure out which hotels close their lounge on the weekends so you can get a bonus 2,500 points as an existing Diamond member. These are often popular with business travelers, so rates are often cheaper on weekends, too. Finally, many hotel credit cards are generous in awarding elite status. This is not a good thing for the middle tiers since a card may award those benefits outright. But if you’re goal is the top tier, there are still options to earn stay and night credits toward elite status either just for having the card or for spending a certain amount. Such benefits are becoming more rare with airlines that have either eliminated the opportunity (United), impose a high annual fee (American), or otherwise offer mediocre benefits (US Airways). There will always be those who say that hotel status doesn’t offer them value. Perhaps they prefer the flexibility of third-party programs like Hotels.com, unique independent properties, or just don’t want to be hamstrung by the limited number of some better brands (Hyatt is awesome, but there are only about 500 hotels). But the same criticisms could be levied against an airline. If flying in coach, they’re all pretty much the same. You’ll have to make a connection if you don’t live in a hub. And finding itineraries with your preferred carrier to visit more exotic destinations (Siem Reap, not Bangkok) isn’t necessarily any easier. The basic message is that hotel status still offers meaningful benefits even though nearly all those benefits are things you can buy a la cart. But I think these are benefits you’ll enjoy more and would be more willing to pay for, unlike a free checked bag that you always carry on. I also like the consistent service and recognition I get as a hotel elite (Hyatt is my benchmark for customer service), and having status with two or more programs gives me a better chance I’ll find a property that fits my needs.